Since the turn of the twenty-first century, the field of positive psychology has sought to implement a science of human flourishing so that we may lead happier, more fulfilling lives. It has found expression not only in academic papers but also popular books and, increasingly, in government policy. The Routledge International Handbook of Critical Positive Psychology is the first volume dedicated to a critical appraisal of this influential but controversial field of study. The book critically examines not only the scientific foundations of positive psychology, but also the sociocultural and political tenets on which the field rests. It evaluates the current field of knowledge and practice, and includes chapters analysing the methodological constructs of the field, as well as others that question what positive psychology actually means by ideas such as happiness or well-being. Taking the debate further, the book then discusses how positive psychology can be applied in a wider variety of settings than is presently the case, helping communities and individuals by acknowledging the reality of people’s lives rather than adhering strictly to debateable theoretical constructs. 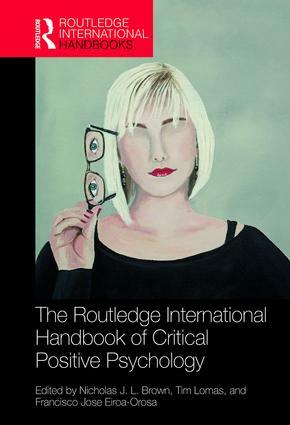 Including contributions from disciplines ranging from psychoanalysis to existential therapy, theology to philosophy, and contributors from throughout the world, The Routledge International Handbook of Critical Positive Psychology will be enlightening reading for anyone interested in how psychology has sought to understand human well-being. Is Positive Psychology an Indigenous Psychology? Community Psychology’s Contributions on Happiness and Well-being: Including the Role of Context, Social Justice, and Values in Our Understanding of the Good Life. Positive Psychology: Intellectual, Scientific, or Ideological Movement? Is Positive Psychology Compatible With Freedom? Nicholas J. L. Brown is a PhD candidate in Health Psychology at the University Medical Center, University of Groningen, the Netherlands. His research examines the claims made by positive psychology regarding the relation between well-being and physical health outcomes. Tim Lomas is a Lecturer in positive psychology at the University of East London, UK. He has published numerous books and papers on topics including positive psychology theory, language, meditation, Buddhism, and neuroscience. Francisco Jose Eiroa-Orosa holds a Marie Sklodowska-Curie fellowship coordinated between the universities of Barcelona and Yale. The aim of his project is to explore the role of context on mental health interventions with key stakeholders such as service users, professionals, and policy makers.